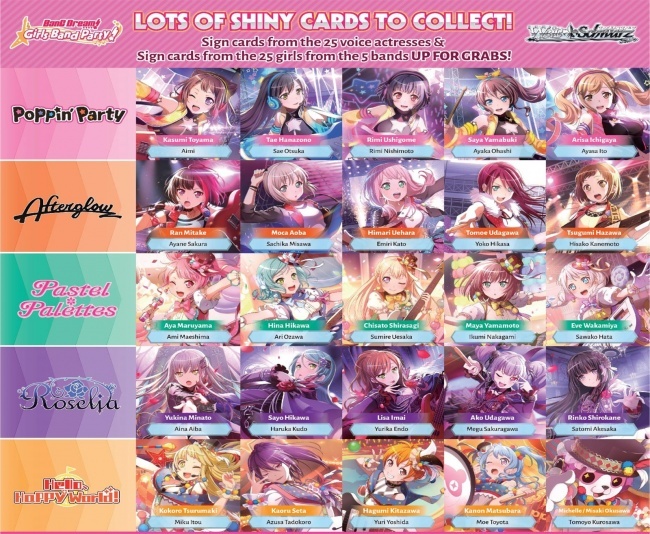 More musical girl cards are coming to the Weiss Schwarz card game, this time lifted from the upcoming mobile game BanG Dream! Girls Band Party. A trial deck featuring one of the bands from that game as well as a new booster set will both release on April 27. The BanG Dream! Girls Band Party! Roselia Trial Deck serves as a way for both novice and experienced players to jump into the new expansion. The Trial Deck focuses on the five characters from the band Roselia, and features two Level 3 Characters with powerful abilities. Each pre-constructed deck has 50 cards, including at least two copies of each card, allowing players to collect full playsets with the purchase of two decks. Each deck will include two foil cards, and some random decks will include special parallel cards, with four RRR cards with special embossing and one SP card featuring the signature of voice actor Aina Aiba available. Each deck also includes a rule sheet, playbook, and playmat. Girls from the BanG Dream! Girls Band Party! will also be found in the booster set of the same name, intended for use with the Neo-Standard Deck Construction format. The complete set includes 100 new card types and 145 parallel cards, packed in eight-card boosters sold 20 packs to a display. The set includes 25 different signature cards with the signatures of voice talent from the game. As an added incentive, each display will include one of five possible exclusive PR cards. Each 16-display carton will include two out of five possible Poppin� Party logo-stamped PR cards and four exclusive rubber playmats. The English language version of the new expansion does not include the gold or silver campaign coupons from the Japanese Edition. They may only be used in tournaments held outside of Japan. Other BanG Dream! characters were featured in a Trial Deck and a booster set last year (see �More �BanG Dream!� for �Weiss Schwarz��). PREORDER WSE TD+ BanG DREAM!